There is no question -- wildfire in Hawaii have extensive impacts on our natural resources from our native forests down to the coral reefs. And there is no question that fighting fires is expensive (and increasingly so everywhere including in Hawaii. Wildfire prevention and pre-fire management are proven to make a significant positive impact on the protection of communities and natural resources and are much more cost-effective than fighting fires. By supporting HWMO's work, you are also supporting our close partners from State Division of Forestry and Wildlife, the county fire departments, and all others who are tasked with putting it all out on the line to fight fires in Hawaii. With the very busy peak fire season erupting this last week, we hope you can consider making a contribution to HWMO to protect our communities, lands, and waters from wildfire. Mahalo! Wildfires have burned roughly 30,000 acres statewide in the past week, gobbling up the state's limited resources for fire response efforts. Among the casualties: The flames scorched some endangered native plants in the Makua Keaau Forest Reserve. "Gouania vitifolia is a plant that has less than 50 individuals in the wild and a significant population was burned. 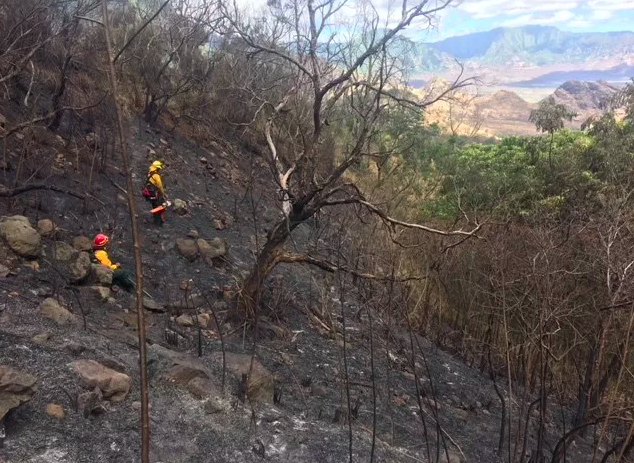 Also, the state flower, hibiscus brackenridgei, we had a little place that was protected for them, managed for them and those burned up, too," said Marigold Zoll, the Division of Forestry and Wildlife's Oahu branch manager. Less than six weeks into the new fiscal year, officials have already spent about a third of the DOFAW's budget for fire and emergency response, including the Kilauea eruption. "Most of our fires are started by people, so if you see suspicious activities, please report it to the authorities," said Trauernicht. "Also beware, don't park in the tall grass, you can start fires from the catalytic converters under your car. "If you're barbecuing or having campfires, make sure you put them out."